Best Beach Coolers | 5 Options For You Beach Goer! / Best Beach Coolers | 5 Options For You Beach Goer! Is there a more pleasant way to celebrate a little rest and relaxation than a trip out to the beach with some friends? What adds to such a great time spent by the ocean are some cool drinks, snacks, and maybe even a barbecue. But you can't have any of those without the right cooler. I'm going to walk you through my picks for the best beach coolers, so that you can hit the sand with the least effort involved. My options range from high-end well-known brands to cheaper alternatives for those on a budget. With all that sun and surf calling, let's get started. The YETI brand dominates the top of the list for the best coolers for the beach and it’s for good reason. This Texas-based manufacturer rolls out great designs with long-lasting construction. Yeti has built a name in recent year by offering premium coolers for those that are tired of the ordinary breakable, leaky models that are sold at large department stores. They take quality seriously and it clearly shows in their products. The Hopper Flip 12 is no exception to that rule, and at the high price point you will pay for the expertise and top-end materials. But keep in mind this isn’t just your usual beach cooler. A good friend of mine actually uses his when he is going to the gym and wants to keep his after workout snacks and lunch cool all day. The cubed body and broad fabric handles make this cooler an easy haul, while the squat silhouette means it can stand up to some of those strong sea breezes. The dry-hide shell can withstand the elements and keep your goods protected. I've used this cooler time and time again and have seen no sign of wear and tear. Finally, the hydro-lock zipper and broad opening also offer easy access to your beachside essentials. Check out all the details in this rad 2 minute video. 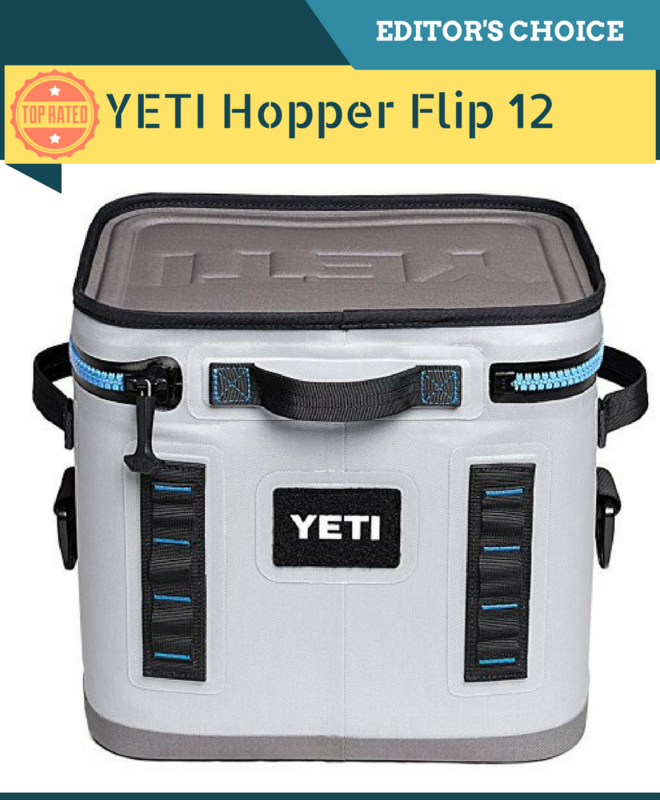 If you need a top notch beach cooler, look no further than our #1 recommendation, the Y﻿﻿﻿eti Hopper Flip﻿﻿ 12. Looking for a cooler with a softer, more ﻿﻿﻿bendable ﻿﻿﻿﻿frame? We recommend the ​traditional Yeti Hopper portable cooler due to it's excellent versatility. The RTIC Soft Pack is the next best beach cooler in my book. At a more mid-range price point compared to the Y﻿﻿﻿e﻿﻿ti Hopper﻿ model above, this is a nice premium cooler boasting impressive durability. With ice-retention of up to five days, the RTIC 30 Soft Pack can more than hold its own under the sun, and the no-leak zipper will prevent any spillage when the ice does start to melt. The foam insulation and a cube shaped body add to this cooler's rugged appearance and use, while the shoulder strap adds comfort and convenience to make hauling it to the sand easy peasy. The zipper can be a little tricky which is frustrating with wet hands, or in glaring light. That was about the only negative feedback we found in a few users. Otherwise, this is a fantastic mid-level choice. Looking for a more affordable model than the Yeti, we know this one will more than surpass your needs on your next day at the beach. Next up is a superb budget option for the beach. The Malibu Mesh Beach Tote Bag is a steal of a deal at an affordable price. This lightweight, small tote bag has an insulated cooler section at the bottom to keep your drinks and snacks chilled for a short day at the beach. The liner is flexible and easy to clean, while the overall construction of the bag is sturdy. We loved the fact that you can use the bag as more than just a cooler as the top section can hold towels or clothes and has a couple handy pockets to go along with it. Naturally, the price and design means this bag is a little different from the other options on our list, but it is a great alternative to bulkier ice chests. One downside is that when the cooler compartment is empty, the bag looses its shape somewhat and can tip over. Also, the cooler compartment is a little smaller than some of the other earlier options we mentioned. These are just a couple of the things to keep watch for. However, if you are looking for a versatile bag where you can keep your food and drinks cool and carry your towels and sunscreen this is your bag and know you won’t be disappointed. A longstanding manufacturer of outdoor gear, Coleman produces some of the best budget coolers available for low prices. his cooler has a removable hard liner so you can pack it to your own requirements. If you need more space, simply remove the hard shell. The adjustable shoulder strap and additional pockets also shows that Coleman had comfort in mind when designing this cooler. The 16-can size advertised is perhaps a little optimistic, as you'll feel the squeeze when packing that much in. The PEVA liner is easy to clean, while the workmanship is generally sound, so you shouldn't find this wearing out before its time. As I alluded to earlier, this is one of those budget big brand coolers, so don’t be surprised if the durability is an issue here. However, if you are looking for a basic cooler at a great price then look no further than this Coleman offering! The final choice on the list of the best coolers for the beach is the Freddie and Sebbie Cooler Bag. Yet another good budget option, this tote bag is portable and very stylish with a classic blue and white stripe pattern. Not only is the construction sound, this bag is also made from eco-friendly materials, so you won't have to feel guilty looking out on the stunning nature of the ocean. The outer pocket is a nice touch and useful for keeping dry goods or toiletries. The long handles make the Freddie ﻿and Sebbie cooler easy to carry, so your stroll down to the promenade won't be too tough. Want a nice stylish design while keeping your drinks cool, we think this might be your best option. Our Honorable Mention has to go to the Yodo 18L Collapsible Cooler Bag. At a low price, this bag will give you a waterproof outer and a roomy interior for your beach-ready banquet. The padded shoulder straps and handles also means it’s as comfortable as it is useful. Again those price sensitive buyers should look no further than this latest Yodo offering. Conclusion: What's The Best Beach Cooler For Me? I hope you have enjoyed our short little beach cooler review List. I've taken us through our top five choices of coolers available online, and there are some really great, new, and innovative options out there today. From more expensive brands like the YETI for serious beach goers, to cheaper alternatives like the Freddie and Sebbie Cooler Bag, there are plenty of choices for your next beach trip. Keep in mind coolers like Y﻿eti Flip Hoppe﻿r are versatile and hold up well over time. Think about how often you plan to use the bag, what you want to store in it, and how long you intend on being in th﻿﻿﻿﻿e sun, and your decision making process should become easier. Given how joyful that first sip of a cool drink on a hot summer's day can be, there are definitely worse decisions you could be making.